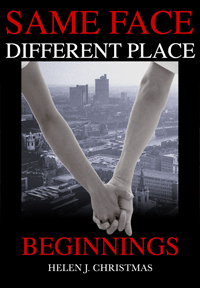 Same Face Different Place by the author Helen J Christmas. 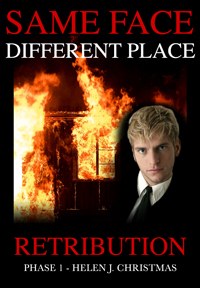 A chilling tale of control, desire and obsession. 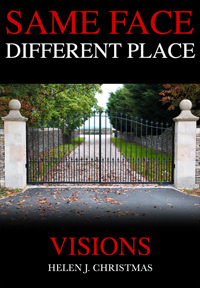 Book 2 VISIONS Blog Tour ran from 8th – 14th April 2018, with a new edition published. 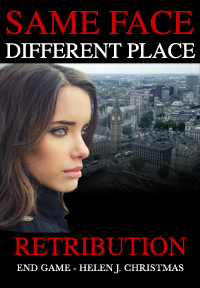 This novel is featured on the websites of #bookbloggers across the UK. See my blog for details. I have to say this is one of the best books I have ever read! Not only was it an exciting page turner, it was the most heart-felt love story that will play over and over in my mind. Helen’s writing is descriptive and captivating. Not many stories have such a profound affect on me. I will immediately be downloading the sequel and purchasing the paperback. It is a book to own and treasure. I loved reading this from start to finish my first by this author and looking forward to reading more. It leaves you hooked from the start the London crime books are one of my favourites and this author could well follow in the league of Martina Cole and Kimberley chambers. Well done to the author. Absolutely loved this book – in fact I never wanted it to end. It had me on the edge of my seat, never knowing what was round the corner. I can’t wait to read the next book in this series. Author Helen Christmas knows how to take a reader for a thrilling ride! This is the second book of her series, I highly recommend you read that as well. Absolutely fantastic book, gripping, great writing. The characters and story line develop from the previous book, there is such evil and such innocence, impossible to put down. This is the 3rd book in a saga which begins in gangland London in the 1970s and spans 3 decades. This book, like the other 2 does not fail to disappoint. Helen is a skilled writer with attention to fine detail on everything from the landscapes, the weather to human emotions through to her back ground research. Her descriptions of scenes and scenery are very carefully crafted. The book can be read without having first read books 1 & 2 because she skilfully weaves in the background to what is happened. The story builds to an extremely gripping, edge of seat dramatic ending in which you can’t turn the pages fast enough; constantly rooting for the main character Eleanor and her safety. I love the way Helen puts events in their historical context. Eg you learn about the rave and ecstasy scene, the 1987 hurricane and why the devastation was so bad. I hope lots of people will read this book because they are missing out if they don’t. Wow again Helen! The ongoing story of Eleanor and her family gradually coming to a brilliant climax…..The writing and the different characters are superb. Just cannot wait for the last book in the series. Highly Recommended . A great book which concludes the on-going feud between Eleanor, her family and friends and Ben and his family and the criminal underworld Ben represents. In this story Peter is under the spotlight when an unwelcome visitor appears and Peter is arrested for something that happened 30 years ago. Ben is still trying to take revenge on Eleanor and her friends, despite warnings from his mother, Rowena. I love Ben because he’s pure evil! This book will not disappoint and I highly recommend! Same Face Different Place | Powered by Mantra & WordPress.